The ringneck snake (also known as the ring-necked snake) is a small, dark-colored snake that lives in eastern Minnesota forests. 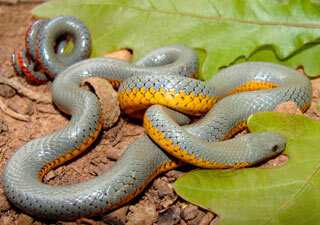 It has a yellowish-orange belly with black markings and a yellow or orange ring around its neck. The aptly named ringneck has a bright band around its neck. Its back is black or slate-gray and its belly is yellow or orange. The ringneck snake grows to be 10 to 15 inches long. Ringneck snakes mate in spring and sometimes in fall. The females lay an average of four eggs in early summer in a nest. The eggs hatch within eight weeks. Young are 4 to 6 inches long. At times, several females lay their eggs in one nest.